Lightweight and easy to use, this LED follow spotlight is a geat addition to any live performance. This spot light is designed for easy setup and basic spotlight operation and features push button control for color changing, dimming and on/off functions. The spotlight size and edge sharpness are controlled with easy to use manual knobs. Don't worry about blowing a fuse, this 75 watt LED technology delivers a bright light from up to 100 feet* with very little power consumption. The unit includes a stand alone tripod for easy movement control. 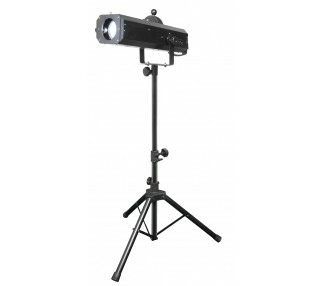 Rent this spotlight for clubs, auditoriums or small/medium sized theaters. * results may vary based on ambient lighting conditions.